Germany attacked the Soviet Union on June 22, 1941. The unexpectedness of the attack, superiority in manpower and army hardware, the experience of fighting in western Europe, as well as the military and political blunders of the Soviet government, enabled the Nazi troops to seize a good chunk of Soviet territory. The main attack was aimed at Moscow and the Germans approached the capital of the Soviet Union in the fall of 1941. They were so close to Moscow that they climbed on the roofs to see what people were doing in the streets of the Soviet capital. Newsreels and snapshots let one see what Moscow looked like in those days. The streets of the city were barricaded with sand bags, people were fleeing their homes. Antitank hedgehogs, reinforced concrete and machine gun emplacements surrounded the city. Home guards were learning to fire old rifles. 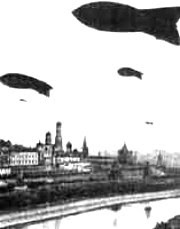 Air balloons were floating in the sky over Moscow. But the Red Army held its traditional parade on the 7th of November on Moscow's Red Square, and news of that shook the world. The parade was held when the enemy was positioned thirty kilometers away from the city. The message was clear: the Soviets had no intention of giving in. It was in that most difficult period that the Army General Georgy Zhukov was made commander of the Western Front of Soviet troops. In his memoirs Georgy Zhukov reminisced how he briefed the man who was replacing him as commander of the Leningrad Front and took a plane for Moscow, on the 7th of November, 1941. He landed in Moscow in the evening and went straight to the Kremlin, to see the commander-in-chief, Joseph Stalin. Stalin invited Zhukov to take a look at the map and said that the situation was most difficult and that he was unable to get a clear picture of what was happening. Stalin ordered Zhukov to go right to the headquarters of the Western Front, to familiarize himself with the situation and to give him a phone call at any time, be it day or night, whenever he was ready to brief him on the latest developments. A serious threat was, indeed, looming over Moscow. The enemy was free to take any road to the capital of the Soviet Union. The Red Army was retreating. Home guards and death squads were formed and sent to fill the gaps in the frontline. Zhukov was planning a bold counteroffensive. Troops and trainloads of ammunition and army hardware were ordered from all over the country to Moscow. And yet, the enemy retained superiority over the Soviets, which explains why it was not the numerical strength of the Soviet units but their fighting potential that came to gain special importance. Reserve buildups on the lines of main attack enabled the Soviets to launch an unexpected counteroffensive on December 5, 1941. The Soviet military leader Konstantin Rokossovsky recalled that the three weeks of heavy fighting, in the course of which Red troops protected every inch of Soviet land and dealt exceptionally damaging blows on the enemy, finally exhausted the Germans. The units of the Red Army launched a counteroffensive, an offensive and destroyed what remained of the Nazi army. The Germans were shamefully running away. This was achieved thanks to the exceptional heroism of the Soviet men, commanding officers who fought with a feeling that they were protecting Moscow. The field log of the chief of the general staff of the German ground troops Colonel-General Franz Halder contains one of the most exhaustive evaluations of the battle of Moscow. Halder's diary says that Germany will never have such troops as it had before the attack on the Soviet Union. Germany lost a substantial part of its army in the suburbs of Moscow. It had made no plans for long warfare, which is why Hitler saw the defeat of his troops on the approaches to Moscow as catastrophic and as the beginning of a tragedy. The Soviet victory gave a boost to the resistance to the Nazi occupation of Europe. General Charles de Gaulle said, in a radio broadcast transmitted from London, in January of 1942, that the French were enthusiastically hailing the victories and growing potential of the Russians. For these victories, de Gaulle said, brought France closer to its goal - liberty and retaliation. The battle of Moscow turned the entire course of World War II. The defeat of the German army kept Japan and Turkey from joining forces with Hitler. The Soviet victory accelerated preparations for the creation of an anti-Hitler coalition and is seen as a preamble to the victorious battles of May of 1945.